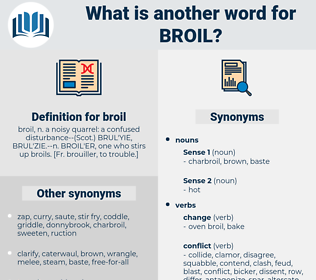 What is another word for broil? The only son had turned out wild and wicked, and had been killed in a broil which he had provoked: and John, a broken - down man, with no one to enjoy the wealth he had accumulated, had given up his office as verdurer, and retired to an estate which he had purchased on the skirts of the Forest. Sprinkle each generously with grated Cheddar, broil until melted and serve with crisp bacon. 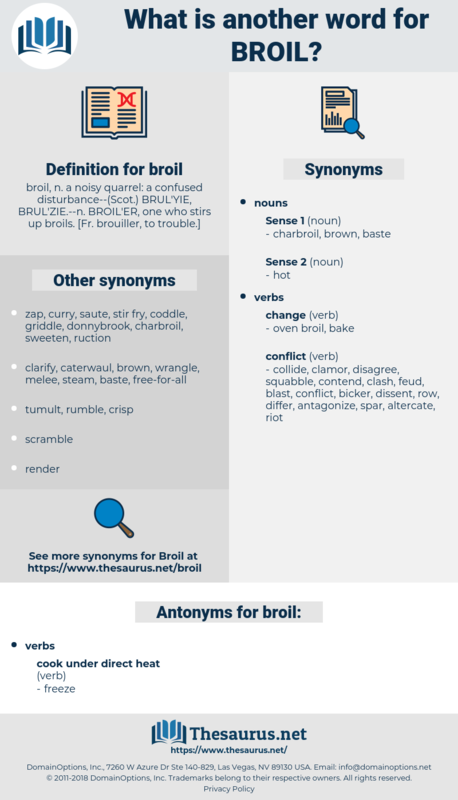 birl, behavioural, brail, biyearly, bovril, boreal, barely, barilla, brawl, burl, barley, brill, behavioral, burial, borrelia, braille, beer hall, bore-hole, brolly, birle, brule, burly, browallia, barrel, biaural, beryl.